Tenebrae (Latin for "shadows" or "darkness") is a Christian religious service celebrated in the Holy Week within Western Christianity, on the evening before or early morning of Maundy Thursday, Good Friday, and Holy Saturday. Tenebrae is distinctive for its gradual extinguishing of candles while a series of readings and psalms are chanted or recited. The Roman rite of Tenebrae was widely observed in the Catholic Church, until liturgical reforms in the second half of the 20th century diminished the practice. Tenebrae liturgy traditions also exist in Anglicanism, Protestantism, and Western Rite Orthodoxy. In the Roman Catholic Church, "tenebrae" is the name given to the celebration, with special ceremonies, of Matins and Lauds, the first two hours of the Divine Office, of the last three days of Holy Week. The traditions regarding this service go back at least to the ninth century. Originally celebrated after midnight, by the late Middle Ages their celebration was anticipated on the afternoon or evening of the preceding day in most places. The structure of Tenebrae is the same for all three days. The first part of the service is Matins, which in its pre-1970 form is composed of three nocturns, each consisting of three psalms, a short versicle and response, a silent Pater Noster, and three readings ("lessons"), each followed by a responsory. Pre-1970 Lauds consists of five psalms, a short versicle and response, and the Benedictus Gospel canticle, followed by Christus factus est, a silent Pater Noster, a devotional recitation of Psalm 50 (51), Miserere (suppressed in the 1955 revisions of Pope Pius XII), and the appointed collect. Unlike the rest of the year, Matins begins immediately with the first antiphon, without the "Domine, labia aperies" followed by recitation of Psalm 94 (95). As with the other offices of Passiontide, the Gloria Patri is at all times suppressed. 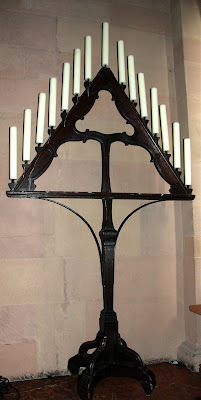 The principal Tenebrae ceremony is the gradual extinguishing of candles upon a stand in the sanctuary called a hearse. Eventually, the Roman Rite settled on fifteen candles, one of which is extinguished after each of the nine psalms of Matins and the five of Lauds, gradually reducing the lighting throughout the service. The six altar candles are put out during the Benedictus, and then any remaining lights in the church. The last candle is hidden beneath the altar, ending the service in total darkness. The strepitus (Latin for "great noise"), made by slamming a book shut, banging a hymnal or breviary against the pew, or stomping on the floor, symbolizes the earthquake that followed Christ's death, although it may have originated as a simple signal to depart. After the candle has been shown to the people, it is extinguished, and then put "on the credence table," or simply taken to the sacristy. All rise and then leave in silence. Some Protestant denominations retained elements of the Roman Tenebrae liturgy, or added others. The name "tenebrae" can be given to various Holy Week services held by Protestant churches including the Lutheran, United Methodist, United Church of Christ and Presbyterian churches. Some liturgical Baptist congregations also hold Tenebrae Services. Variations of Tenebrae are sometimes celebrated in less formal or non-denominational churches as well. Some churches of the Anglican Communion celebrate Tenebrae with the same rite as Roman Catholics. Anglicans, including the American Episcopal Church, usually observe the service on Wednesday in Holy Week, thereby preserving the importance of the Maundy Thursday and Good Friday observances. The Episcopal Church provides a single Tenebrae service on Wednesday evening, the day before Maundy Thursday. That service reduces the total number of Tenebrae lessons, each followed by a responsory, to nine. I know there will be times you feel as if there is no fight left inside of you. I will rescue my girl in your moments of weakness and you will feel my spirit rise up inside your soul. I will put a new passion in your heart to win any battle. In my power you will find the strength to face every spiritual giant. It is time, my daughter, to get dressed for battle and fight for your friends and family who are to weak to fight for themselves. Now, clothe yourself in my truth by reading my word and put on every piece of my armor by praying and obeying. You may be young, but you are mighty with me on your side--so step out in faith and take your appointed position in life! Although it is frequently celebrated on Maundy Thursday or Good Friday, the Tenebrae is a liturgy that is often celebrated on this day. The word tenebrae comes from the Latin meaning darkness. In this service, all of the candles on the altar table are gradually extinguished until the sanctuary is in complete darkness. At the moment of darkness, a loud clash occurs symbolizing the death of Jesus. The 'strepitus', as it is known more probably symbolizes the earthquake that followed Jesus' death: "And, behold, the veil of the temple was rent in twain from the top to the bottom; and the earth did quake, and the rocks rent" Matthew 27:51(AV). In the Orthodox Church, the theme of Holy and Great Wednesday is the commemoration of the sinful woman who anointed Jesus before his Crucifixion and Burial; a second theme is the agreement to betray Jesus made by Judas Iscariot. O Lord, the woman who had fallen into many sins, sensing Your Divinity, takes upon herself the duty of a myrrh-bearer. With lamentations she brings you myrrh in anticipation of your entombment. "Woe to me!" she cries, "for me night has become a frenzy of licentiousness, a dark and moonless love of sin. Receive the fountain of my tears, O You who gather into clouds the waters of the sea. Incline unto me, unto the sighings of my heart, O You who bowed the heavens by your ineffable condescension. I will wash your immaculate feet with kisses and dry them again with the tresses of my hair; those very feet at whose sound Eve hid herself in fear when she heard You walking in Paradise in the twilight of the day. As for the multitude of my sins and the depths of Your judgments, who can search them out, O Savior of souls, my Savior? Do not disdain me Your handmaiden, O You who are boundless in mercy." Today the church remembers Gregory the Illuminator, Bishop and Missionary of Armenia, c. 332. Armenia, the first Christian kingdom in history, was converted through the efforts of Gregory. This kingdom came to an unhappy end as an independent state in 430, yet some two and one-half million persons today are still culturally Armenians. They enjoy a racial, linguistic, and religious heritage which is one of the world's oldest and richest. Their community has endured fifteen hundred years of dispersion, harassment, and often severe persecution. The truly marvelous story of Christian Armenia began when the infant Gregory, who was a prince by birth, was exiled by enemies and reared by a compassionate Christian family in Cappadocia (modern central Turkey). As an adult and a Christian he returned to Armenia and converted the king, Tiridates, heir of Gregory's old enemies. This was not done easily. Indeed, many legends have grown up around the tradition of Gregory's great difficulties, hardships, and sufferings in effecting the conversion of the king and subsequently the kingdom. For this work he is called the "Illuminator." Gregory was eventually consecrated Bishop of Echmiadzin and was the organizer of the Armenian Church. We thank you, O God, for the witness of Gregory the Illuminator and for the people of Armenia. Amen. Almighty God, whose will it is to be glorified in all your saints, and who raised up your servant Gregory the Illuminator to be a light in the world, and to preach the Gospel to the people of Armenia: Shine, we pray, in our hearts, that we also in our generation may show forth your praise, who called us out of darkness into your marvelous light; through Jesus Christ our Lord, who lives and reigns with you and the Holy Spirit, one God, now and for ever. Amen. As Holy Week unfolds, events seem to spin out of control. The authorities thirst for blood. Jesus’ followers don’t seem to understand who he is or what they are to do. And even his friends betray him. This day is sometimes called Spy Wednesday because it is the day when Judas sneakily betrays Jesus. It would be convenient for us to cast Judas as the story’s villain and move on. But it’s more complicated. For one thing, it was Judas’s betrayal that led to Jesus’ arrest, trial, crucifixion, death, and resurrection. Some theologians have said Judas is an instrumental part of our salvation. There’s an even more compelling and personal realization though. You see, Judas isn’t the only one who betrayed Jesus. I have betrayed him, and so have you. Jesus said the way we treat the “least of these” is how we treat him. I know I have ignored Jesus in the person of those who need my help. I have turned my back on Jesus. The events around our betrayals are probably less dramatic, but they are just as real as Peter’s.